Real Madrid will remain the league leaders for at least another week, after hosting and beating Deportivo by 2-0, thanks to goals from Isco and Benzema. 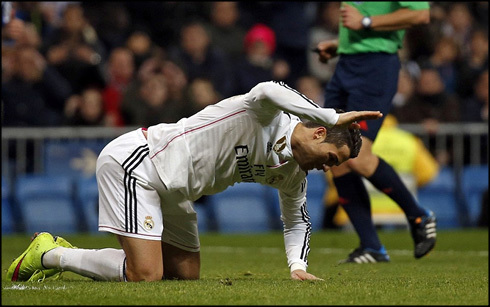 Cristiano Ronaldo played the whole game, but failed to find the back of the net for his 3rd consecutive match. The last time Real Madrid were facing a “crisis” situation, a match against Deportivo La Courna turned out to be the perfect remedy. That time, about five months ago now, it was a crushing 8-2 victory that bolstered confidence and put Los Merengues back on track. This time it was only 2-0 though, as Deportivo were far more impressive than they were that day, still it was a good performance from a Madrid team that's been looking for reasons to celebrate as of late. Isco and Karim Benzema secured the 3 points by scoring a goal each and Carlo Ancelotti's men can now start focusing on Schalke 04, their next challenge in the UEFA Champions League. The match started off with Deportivo taking the game directly to Carlo Ancelotti's side. They forged ahead confidently, looking an entirely different team to the one that raised the white flag minutes into the first half earlier this season. Lucas Perez and former Barcelona man Isaac Cuenca, were particularly dangerous in the opening minutes. Real Madrid eventually found their feet and had a couple notable chances of their own. Cristiano Ronaldo's left footed shot clattered off the cross bar and a few minutes later, Gareth Bale's power drive met the same fate. 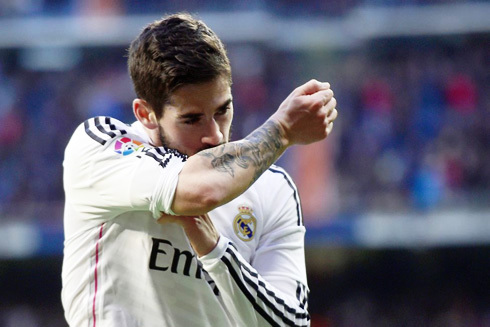 However, it would be Isco who would break the deadlock after 22 minutes. A scramble in the box would eventually leave the Spaniard with the ball just outside the box and he would then unleash a curler just out of the goalkeeper's grasp. It was the mirror image of the away goal he scored against Almeria earlier in the season. The midfielder's form has been phenomenal this season and he's become the darling of the Bernabeu. The fans cheered enthusiastically as he trotted off celebrating. 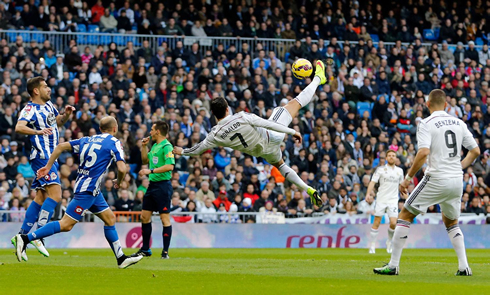 Despite the goal, Deportivo wouldn't be fazed and they kept taking the game to Real Madrid. Ivan Cavaliero was especially active, the speedy winger on loan from Benfica often caused problems for a Madrid backline clearly still missing both Pepe and Sergio Ramos. It would be a nervy second half for Real Madrid at the Bernabéu. Early on, Deportivo seemed set to secure an equalizer. In the 49th minute, Celso Borges had his shot ricochet off the post. Only a few minutes later, Iker Casillas would be forced into a point blank save from an Oriol Riera header, as Madrid attempted to weather the early storm. 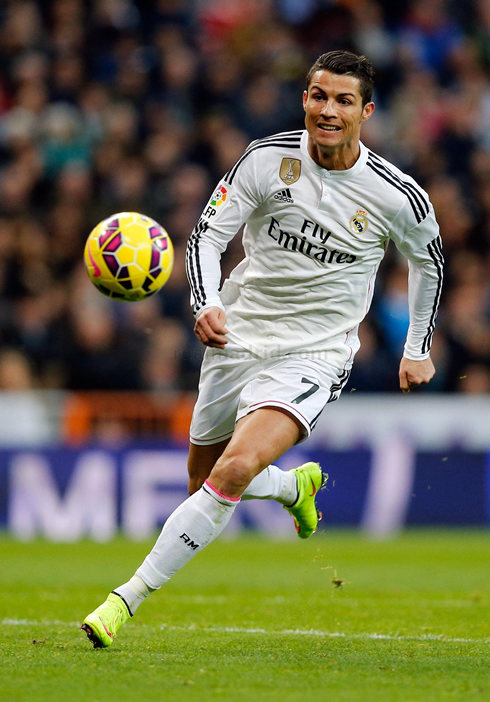 The hosts wouldn't seal the game until the 73rd minute through Karim Benzema, off an assist from Cristiano Ronaldo. An instinctive touch on from the reigning World Player of the year set up Benzema for a 1v1 and the Frenchman brilliantly chipped the ball over the keeper and in off the post. The game also saw a debut for Lucas Silva, who slotted into the midfield for Asier Illarramendi in the second half. It's far too early to judge the Brazilian, but with all the injuries he will certainly be relied on to contribute soon. But all in all, it was an important win for Real Madrid in their quest for La Liga. Up next? Onto the Champions League and a rematch with Schalke. Cristiano Ronaldo next game will be for the UEFA Champions League against Schalke 04, on the 18th of February of 2015. You can watch Juventus live stream, Schalke vs Real Madrid, Barcelona vs Levante, Aston Villa vs Leicester City, Arsenal vs Middlesbrough, and Bradford vs Sunderland, all matches provided from our football streaming section.